I see that Lewis Hamilton's biography, "My Story", (now there's an original title) is due to be released on November 5. Ignoring jokes about its brevity and so on, it might actually be quite interesting as a source of information on his years in the lower formulae and just how much input Ron Dennis had into his career. The taster released to focus our attention goes straight to the dessert, however - the relationship between Lewis and his team mate, Fernando Alonso. I suspect that we are all hoping that Alonso does indeed leave McLaren soon so that we can move on from constant dissection of the squabble between these two. They are not the first team mates to have had a robust and ultra-competitive relationship, after all. 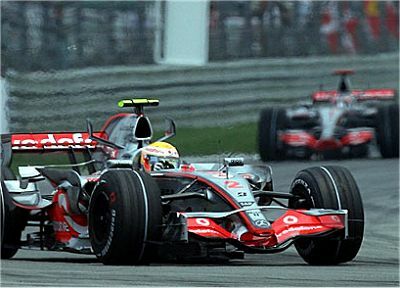 In fact, true friendship is pretty rare between F1 drivers, as mentioned by Alex Wurz recently. That is only to be expected, the nature of the sport demanding a level of competitiveness in its practitioners that is way beyond that in most other professions. The really surprising thing is that friendships between drivers do occur at all. Alex mentions that he gets on well with Pedro de la Rosa (who doesn't? ), Giancarlo Fisichella and Nico Rosberg, but the most obvious and genuine friendship between team mates this year has also been rather ironic in that it was ended rather abruptly by the team itself. I refer to Vitantonio Liuzzi and Scott Speed, of course, two drivers who had much to prove and only each other to be measured against. In the circumstances, it is quite remarkable that they seemed to enjoy each other's company and spent much time together in leisure pursuits away from F1 races. Have a look at the videos on Scott Speed's website to see just how genuine their friendship was. Perhaps it was the hostility of the team towards them both that forced them together. But there is no doubt that, in spite of it being in each one's best interests to trounce his team mate on the track, they did not allow that to interfere with their personal lives. Critics would no doubt point at this as evidence of them lacking "the killer instinct" necessary to succeed in F1 and maybe they would be right. But I think it shows a healthy understanding that it is a sport in the end, something that is not more important than who or what you are. "Nice guys come second," we say and are then astounded when our heroes prove to be selfish and spoiled, egotistical and vain. We react with surprise and shock when Alonso holds up Hamilton's pit stop and then tut-tut on being informed that Lewis disobeyed team orders. But we cannot have it both ways; if the bad guy always gets the prize, we can hardly expect the winner to be an angel. So I find the tiff between the McLaren team mates unsurprising and slightly boring - without Alonso's constant feeding of the flames in his statements to the Spanish press, the business would be entirely unremarkable. Yet people will buy Hamilton's book to find out more; our appetite for human drama is insatiable. No doubt its sales will amount to "a nice little earner" for the latest British hero. Going to the main thrust of the entry, I agree with you entirely. Sport, even at a fairly high level, doesn't have to involve everyone attacking each other or so little friendship. Some of my best off-line friends are competitors from swimming galas I've competed in (these include some friendships forged in top-level national galas). Friendship is not a sign of lacking competitiveness - it's a sign of maturity. It seems a bit strange that being nice off the track is viewed so negatively in terms of on-track ability. Perhaps they were preoccupied with what to name his street? Lewis Lane being my own personal favourite. LOL Yeah, most likely, F1Punter. This book is only the, what, sixth LH autobiography to hit the shelves? Are any of them any good? From what I understand he hasn't contributed directly to ANY of them, so I'm pretty skeptical. Oh well, as bad as this one is, it can't be as bad is the one that proclaimed him 2007 champion when it was released a few months back! A sign of the times, Eric. These days, as soon as anyone gets a "name" for themselves, the ghost writers are there, scribbling away like crazy. I'm so old that I can remember when biographies didn't get written until the person was dead. In fact, even autobiographies had to wait until the writer had one foot in the grave! Can't wait to hear about his pedal car and toilet training. Re: Speed/Liuzzi- one of the few drivers to come off with an actual "personality intacto" is David Coulthard. Perhaps because early in his F1 career he also fell foul of some team machinations, albeit not on the Toro Rosso scale . In his case it was pr and perhaps Bernie/Max trying to salvage a season, not his team manager grabbing him by the scruff of the nomex. Now that I think about it, I wonder if maybe Speed isn't one of the brightest baubles in the box. If my employer shouts at me and grabs my collar, I get to sue and retire. I doubt these boys can-or actually want to do that. By being perfectly candid, because he had witnesses, he may have actually gracefully exited something he'd rather not be involved in anymore without actually having to forfeit anything. Was there anything remaining on his contract and how difficult is it to get out of a driver contract? I think the book dated rather quickly, since it didn't even have the results of the WMSC case, let alone the season results in it. And there wasn't just one of these books in there - I saw about a dozen identical copies in three parts of the shop, in what appeared to be a desperate attempt to shift the stock. Definitely sounds like one publisher is going to be making a loss on that one. Herd mentality rarely produces anything new, though, and it's new things that people want when they shell out £12 (the book's original RRP) or more on books.